When you Digiprove a file, you create irrefutable evidence that it exists in exactly that form at that point in time, and that you are in possession of it. This is critically important for creators of all kinds, from photographers to songwriters, from inventors to web-site designers. You select a file or files on your computer with the content you wish to Digiprove. This can even be a zip file with lots of content, for instance a photographer could Digiprove hundreds of images in one step. The "digital fingerprint" of the content is calculated by the Digiprove system. This uniquely identifies your file. Your file does not need to be uploaded to our servers so you can be absolutely certain of confidentiality. You will receive by email a Digiprove certificate that you are in possession of the file with this fingerprint. That's all there is to it. As long as you retain a copy of your original file you will always be able to prove absolutely & irrefutably that you had possession of this digital content. A Digiprove certificate is written in plain English, and it is enclosed within a digitally-signed file. The digital signature is important because it proves that the certificate has come from us and is included in our secure, provable audit trail. More about Digiprove certificates. 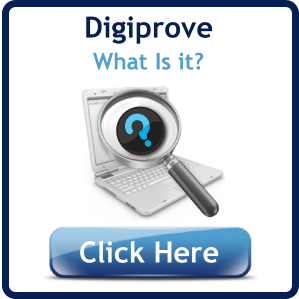 What's so different about Digiprove? 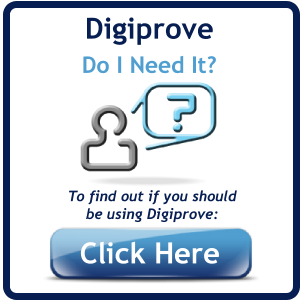 The Digiprove service is indeed different to other systems and services you might have looked at. Because it is a patented process, the same thing is simply not on offer elsewhere. More about what makes the Digiprove service different. If you think this service could be of value to you, and would like our opinion in confidence, please contact us. Read our summary of Copyright - The international dimension. We offer a free "Basic" subscription which is suitable for low volume users (or just to try it out). You can Digiprove up to 3 files of any size, even zip files, with this subscription. Register for a free Basic account. You can also subscribe to one of our monthly or annual payment plans. Each plan incorporates an allotment of Digiprove "credits" which are used to pay for your usage of the service.